Tyson’s Corner, VA: Earthling Security, LLC is pleased to announce that the company has launched its secure content collaboration platform EarthlingDocs™. This platform can be used by customers for secure document sharing and collaboration. Users have the option to use the tool within a cloud environment or on-premise providing key flexibility and control. 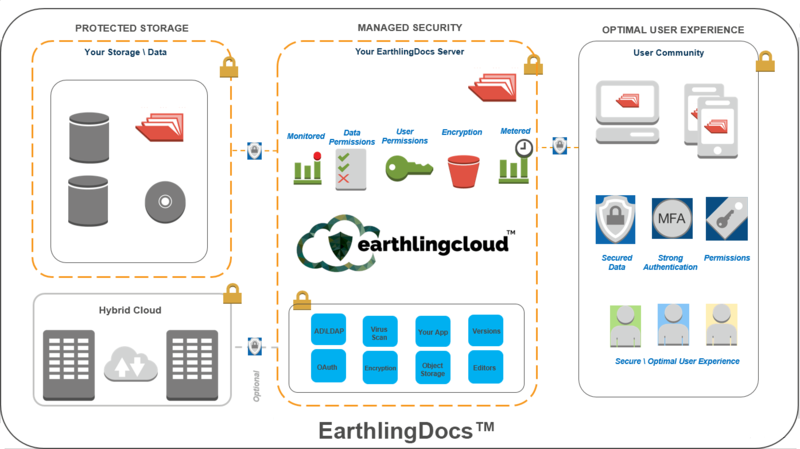 For optimal use and added security customers can use EarthlingDocs in Earthling’s managed secure cloud platform, EarthlingCloud, in either Amazon Web Services (AWS) or Microsoft Azure. Earlier this year, Earthling Security launched version 2 of its secure cloud platform EarthlingCloud™ which includes managed compliance and security operations services for web application hosting. The Earthling Team is now launching its EarthlingDocs™ product as premier secure document management and collaboration platform. EarthlingDocs™ offers a range of capabilities, and can be utilized to support simple secure file sharing (a secure dropbox-like solution) or a full, robust Enterprise Content Management system. Auditing: who accessed what, when, and what did they do? These capabilities can be provided via the platform, are accessible by any device securely. The flexibility in the EarthlingDocs deployment model helps meet a range of federal information security standards including FedRAMP, FISMA, HIPPA, and PCI. The EarthlingDocs™ solution combined with the EarthlingCloud™ platform provides a complete Compliance-as-a-Service approach to security and governance that is perfect for enterprises preparing for regulatory certification, audits or on-going compliance program efforts (HIPAA, FedRAMP, PCI etc.). The EarthlingCloud™ is the perfect platform to attain regulatory compliance and certification for FedRAMP, FISMA, HIPAA and PCI.